One of Chicago's food deserts is getting a much needed oasis. This week, Whole Foods grocery store opened a new location in the Englewood community at 63rd and Halsted streets–its 27th in the Chicago area–and much more community development is expected along with it. The complex where the store sits is called Englewood Square. Starbucks has already opened its doors there and Chipotle is in the hiring process for its restaurant next door. There are also a couple of local businesses: a clothing store and a nail salon. 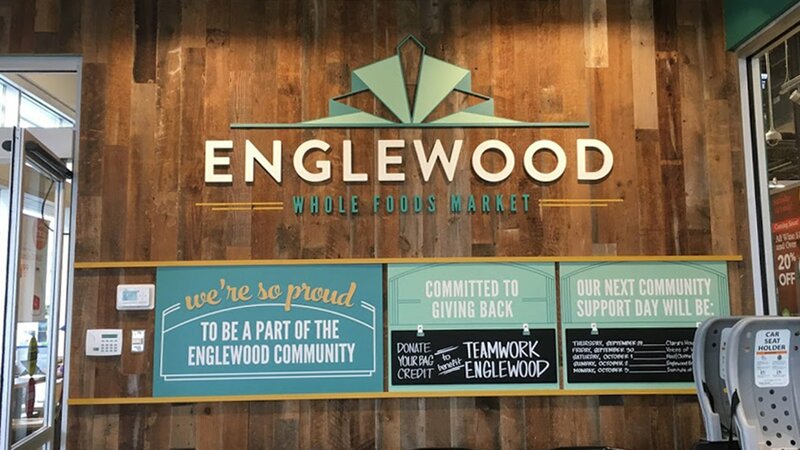 On Thursday, the Greater Englewood Community Development Corporation confirmed a Whole Foods Demonstration Kitchen will be opening across the street. The store itself is 18,000 square feet and it's been in the works for three years. The company says it approached this store differently, by engaging with the community much more than it usually does to find out what residents wanted in their store. Among their concerns were employment and economic opportunity. So, after a two-day job fair where 900 people interviewed for jobs, 85 store employees are from the South Side, 35 of them are from Englewood specifically. They also wanted affordable options–there's a reason Whole Foods has the nickname Whole Paycheck–but at this store, the food does cost less. “Definitely there are lower prices here and some very reasonable prices. For an example, whole milk is $1.99 a gallon here, and it’s roughly $4 a gallon in our other locations,” said Michael Bashaw, regional president of Whole Foods. “I think you can go all through the store and look at commodity, day-to-day items that you need to feed your family, and you’ll find those good values. Another way the store has created opportunity for businesses in the area is by selling products made by small businesses in the area. Again, the Greater Englewood Community Development Corporation says it's worked to get over 38 of those products on store shelves, from health and beauty items to dessert foods. The director there says the benefits extend beyond the economic. And also, just to compare, one of our producers and I did some comparison shopping at both the Englewood store and the Edgewater store. When plans for the store were announced, there were some concerns about gentrification. That’s not a concern today. It's easy for some folks to forget Englewood's business history: Once upon a time in the mid-20th century, it was the second largest shopping district in the city, outside of downtown Chicago. There was a Sears to anchor the community, and a major grocery store with fresh foods. All of that left in the ‘60s and ‘70s, exactly where this new development sits today, and the community went into decline. Now neighbors who can walk to the grocery store from their homes say they needed this positive change. “The health aspect is very important to me because I am a trainer and nutritionist,” said Andrea Natay of the Residents Association of Greater Englewood. “Being able to walk into a grocery store and the first thing you see … is the produce aisle, that’s very different from some grocery stores that are in and around Englewood and other urban communities. The first thing you see are processed foods when you walk into those grocery stores. Sept. 7: As homicide rates in Chicago soar, a new street festival looks to highlight the positive side of a South Side community that often makes headlines for crime. May 17: Meet the woman who makes her living hosting visitors from all over the world in every nook and cranny of her four-bedroom, two-bath home in the Englewood neighborhood on Chicago’s South Side. May 9: It's still months away from opening, but a new Whole Foods store in the beleaguered Englewood community has given residents and local entrepreneurs a lot to look forward to.